As far as conflicting statements go, prisoners from the Camp Street Prison have managed to offer different reasons as to why there was a three day riot that saw 17 inmates being killed in a morning blaze. Inmate, Desmond James was the latest to give evidence to the Commissioners at the Commission of Inquiry and stated that he had never seen inmates upset or angered over the seizure of cellular phones and other contraband in the past. James made the statement while being cross examined by Attorney Dexter Todd who was representing the interests of Delroy Williams (deceased inmate) and Marcellus Verbeke. The inmate told the attorney “No sir,” when asked about the behavior of his fellow inmates. Asked about the smoke that he saw in the prison dorm at the time of fire, James was positive that the smoke was emitted from a tear gas canister. “Is one big heavy smoke…It come from the corner and go up to the ceiling and come back down…I never see such smoke like what I see there sir…Mattress smoke don’t burn your eyes and skin like that sir,” said James. While being questioned by Selwyn Pieters, the Police and Prison Attorney, James was clear that he had never seen any contraband in the prison. However he later testified that he had witnessed inmates fire on a mattress before and the smoke from the mattress different from the smoke on March 3. Pieters picked up on this and questioned the veracity of the statements being made by the inmate. However his repeated and stern questions were opposed by young Attorney Darren Wade. Wade pointed out that the witness was being cross examined by the Attorney and questions which were asked and answered before were being asked again. 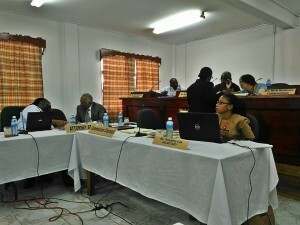 The objections were upheld and Pieters asked to move on with the line of questioning.